Last year John Grimek wrote me: - "If I ever come out to South Africa one of my chief reasons would be to hear some of those wonderful stories which you can tell." Of course, the one and only John Grimek was referring not only to my stories of the many wonderful "Men of Might" I have known, but to the hair-breadth escapes I have had while elephant hunting, and a few close calls with wounded lions and buffalo. Yes, after John had won the Mr. Universe title in 1948 (I was one of the judges) we got to know each other pretty well, he and I.
George Hackenschmidt and I told each other many a good yarn. To listen to Hackenschmidt talk about his amazing career is something out of this world, for he has defeated all the great wrestlers I knew in my early days, and the way he tells of his victories over such giants of strength as Madrali, etc., is really entrancing. There is a complete absence of conceit; his accounts are just plain statements of fact and never was there a less conceited man than the REALLY great "Russian Lion." Despite my great experience of strongmen over the past fifty years he will always remain, in my opinion, not only the greatest wrestler of all time but also the greatest heavyweight "athlete." He was not as strong as Görner, but his whole appearance and all-round athletic ability and "quality" struck me as beyond belief when I first met him (when I was only a lad of 16), and this impression has never been altered by anything I have sen in the fifty years I have been so intensely interested in "Men of Muscle." My three proteges Josef Steinbach, Max Sick and Hermann Görner were all world-beaters: Görner and Steinbach were both stronger than Hackenschmidt, and Max Sick was more "wonderful" but nevertheless none of the three had that really terrific "class" that made such an unforgettable impression on my mind. These reminiscences are coming to you, dear Ironmen of the World, because Joe Weider in a recent letter happened to say: - "I know you have much information about the old-timers and I am sure our readers will like to read about your experiences etc." Well, friends, if I bore you don't blame old man Tromp. Just write and tell Joe that you want to throw a brick at me, I'm thousands of miles away from the USA so the brick will have to be a "flying saucer." Perhaps it will be a good plan to first tell you something about those three Supermen with whom I was intimately associated. Josef Steinbach and I met each other under rather unusual circumstances. As a matter of fact I was standing on a table in a "Bier-Keller" in Vienna when we first met. I agree it is not often that you are introduced to a man while you are standing on a table. It was way back in 1904; I was reporting a big wrestling tournament for the "Illustrierte Athletik Sportzeitung" of Munich and after the finals we were all drinking nice cool Pilseners when the band of giant athletes around me insisted that I should strip and do my 'Musical Muscle Control" act to the waltz which was being played as only those Vienna Orchestras can "put it across." I had often done this act of mine at the request of wrestlers in various big cities in Europe, for I was probably the first man to really make all his external muscles dance in strict time to music. Without being concerned I must say that I have never seen anyone else do this stunt quite as efficiently as "exactly" as I did it and still do it. Well, on that night in Vienna I was bowing to my strongman audience in acknowledgement of their appreciation when a mighty big and strong hand smote me on my shoulder and a fine deep voice said: - "Junge, Junge dass war wunderbar so etwas habe ich noch nie gesehen, wenn Strauss noch lebete hätte er sich entweder tod gelacht oder hätte er Dich mit ein Lorbeer Kranz belohnt." (Boy, that was wonderful, I have never seen anything like it before, if Strauss had still lived he would either have laughed himself to death or he would have rewarded you with a laurel wreath.) The compliment was a doubtful one but when Hitzler (the Munich Champion) jumped up and said, "Tromp, let me introduce you to Steinbach," I was enthralled, for the great Vienna strongman was a hero in my youthful eyes and he was certainly the strongest man in the world. There and then started a friendship between the young Boer from faraway Africa and the wonderful man who seemed to defy gravity itself when he handled masses of iron. I Josef's company I met all the "greats" of Vienna and believe me I'm not at all sure that those men could be defeated by any team today for sheer strength. It is, of course, difficult to make comparisons because today we have far better barbells. Discs (plates) were almost unknown then, and we have more scientific training methods as well as a greater understanding of the "science" of the Iron Game. Perhaps it was just because of the lack of "science" that those men were so strong, their barbells and dumbbells were clumsy, the bars lacked "spring" and liveliness, there was no proper "balance" but the terrific "do or die" temperament was there in big measure and the weights HAD to go up even if they were not the magnificent "Olympic" type we use today. In this way those bighearted, big-muscled men became STRONG just because it needed more strength to put 300 pounds above your head then than it does today with our greater understanding and our better apparatus. Steinbach impressed me so from the very first that I never missed an opportunity to give him a "boost" in the notes I used to write for the "Illustrierte Athletik Sportzeitung" and surely he was a worthy man to write about for his strength was so colossal that I could not imagine there was anyone to measure up to him. There were, even in those days, rumors about the Greek amateur Tofalos (in the photo above - #700), who was reckoned so unbeatable that the Greeks looked upon him as a sort of god. Even today, when I tell them that I once had a protege who actually made the great Tofalos look cheap they just won't believe me until I show them the proofs. There was another budding strongman coming along then by the name of Karl Swoboda but he had not yet taken the Iron Game seriously. He was then only 22 years old but he looked as if he would be a colossus of might some day. When the very great Karl Witzelberger got Swoboda into real training a couple of years later thing DID happen, but I will tell you more about him later. Anyway, long before he jerked 400 pounds I wrote that he would surpass this figure and he did by a good margin eventually. Amongst our training pals were Witzelberger who later did a two hand press of 300 pounds and correct military one hand press of 162 pounds. (Who on earth could do that today! ), Grafl, who never really had technique but who was to become world's amateur champion in due course because of his sheer brute strength, and his minute and very able little coach-man Emil Kliment who, though weighing less than 130 pounds at that time, often jerked his double bodyweight during our training bouts. Note: More on the One Arm Military Press (and poundages) in Alan Calvert's book "Super Strength"
Are you surprised that I considered him to be a world-beater and that I told him he would easily beat the Greek Tofalos? After all, Steinbach had won the World's Amateur Championship soon after we parted in 1904 and then he beat our gigantic pal Grafl, while before we met again in 1905 he had again won the World's Championship, this time having our very strong friend Witzelberger as runner-up. Görner was only a lad then so we had not dreamt of a stronger man than Josef coming along. Steinbach was a very strong man even in those days and always weighed over 250 pounds at a height of 5 ft. 10 in.. His waist was big, never being under 40 inches, but then his chest was just over 50 inches. As biceps go nowadays his were not really big for they never reached 18 inches, but he had fine calves, measuring a full 18-1/4 inches and his thighs were 28-1/2. The most amazing thing about Josef was his terrific ENDURANCE, and if you had seen the clumsy barbells and thick bars he used you would wonder all the more at what that grand Iron Man did. I saw him press 300 pounds quite correctly and without much strain FOUR times before he put the weight down quite gently almost without a bump. He also jerked 374-1/4 pounds five times! I wasn't there that time but the information is correct. I saw him press 260 pounds twice while sitting in a chair; try this if you are in the heavyweight class, it is REALLY good for those triceps. Steinbach and Tofalos did eventually meet at the Olympic Games held at Athens (see photo above) in 1906 and my pal didn't win. Thanks to Gherardo for producing this book! He's a member of long standing at Joe Roark's Iron History website (that link up top) . . . if you dig this stuff you'll get lost over there. He (Steinbach) made Tofalos look silly when he got really angry. I think I cannot do better than to use the words of my good friend W.A. Pullum, the marvelous British lifter and historian, to whom I entrusted the welfare of my greatest discovery (the "strongest of them all," Hermann Görner), when I sent him to England. "The single hand contest on April 26th was won by Steinbach with a lift of 168-1/2 pounds on a long-handled dumb-bell. The next day the two hands lift was taken, but before the event was decided an organized demonstration was made by the crowd (this was in Athens, Greece, remember) on the grounds that he was not an amateur (an allegation entirely false). This would probably not have upset him so much as was intended but for the fact that he was already emotionally unstrung through just having received notification of the death of his son. The two things added together, and therefore he obviously didn't enter the lists under the best possible conditions, making only 300 pounds under the circumstances. 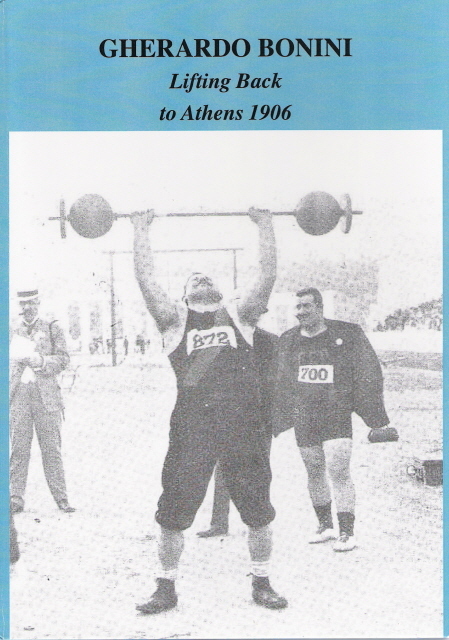 Tofalos of Greece, the national hero (winner), did 314, being permitted to lift on his own bar - also in a style to the chest that was very much otherwise than "clean." Steinbach had got a grip on himself, however, by the time Tofalos had been pushed home in this manner and altho' it could make no difference to his own position (2nd) he asked to be permitted to attempt to lift the 314 pounds on Tofalos' bar. This was allowed, whereupon, lifting savagely, Josef pulled the weight in perfectly clean, then JERKED IT OVERHEAD SIX TIMES IN SUCCESSION! This was the real Josef Steinbach now on show, making everyone realize how lucky had been Tofalos - even with all the favor shown him - to get registered as the winner." Round about these years Arthur Saxon was filling the music halls with his amazing brothers in a positively terrific Strong Act which was far more genuine and positively amazing than anything that had gone before. Practically every night Arthur would bent 336 pounds (nearly everyone believes that he once did 371 pounds but this is NOT correct). It was in 1908 when I first wrestled young Hermann Görner at the Atlas Club in Leipzig that I got to know more about Arthur Hennig (Saxon's real name), and I realized that he was NOT the strongest man in the world but that my own protege Josef Steinbach (whom I had encouraged and boosted so much while he was an amateur) would quite easily defeat him in a professional match. 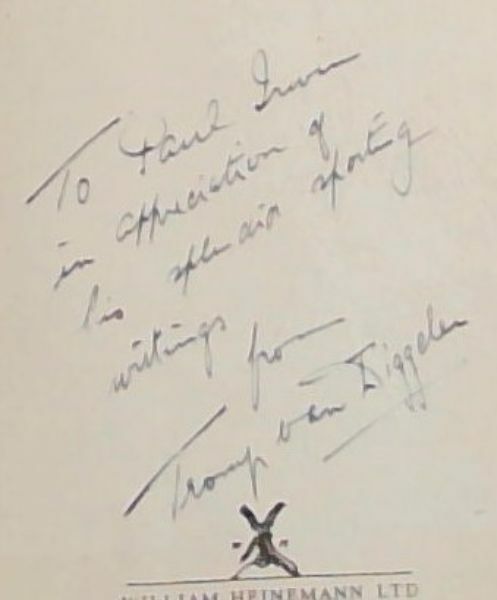 I went to see Josef and told him I knew and, when I was back in London, he wrote me that as he was now professional I simply must challenge Saxon on his behalf. There was a great deal of newspaper talk, and more than once Saxon published statements that he would accept our challenge, but I knew all the time that the match would never really take place for Saxon knew far too much about the game to imagine that he had a chance against Josef. To tempt him we put in four one-handed lifts, but it was all to no purpose, for Arthur evaded the issue by going to the USA. 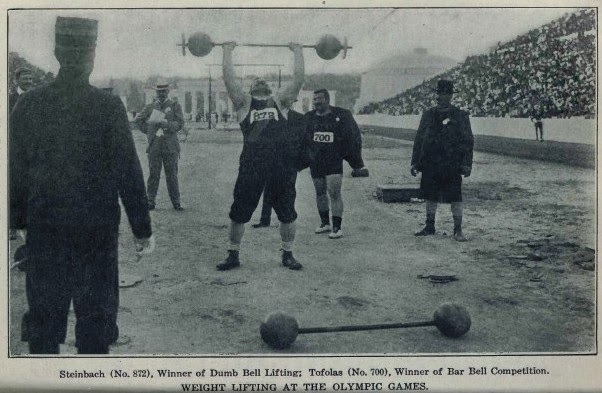 Of course, few of the Public knew that Arthur and his two brothers had more than once practiced together at the famous old Vienna weightlifting club "Turk Wien D'Eisermen" which was founded by the enormously strong Wilhelm Turk and later had its headquarters at Swoboda's restaurant. It has been said that there was not enough money in the match to make it worthwhile for Arthur, but this was not correct, for we challenged him for £1,000 which in those days was real money and even then represented 5,000 dollars. After Hermann Görner, I would still nominate Josef Steinbach to be the strongest man I ever knew. He most certainly looked the part of a really great Strongman and he really was one of the greatest of all times. He was born in Horschau near Pilsen in 1879, and when he passed away nearly sixty years later I lost a true friend and the world lost a man whose name will never die as long as our manly sport of Weight-lifting is practiced.